Some pics of the N-23 show what seems to be a wing dihedral similar to the Raider. That pic of the Conejo airport takeoff demo was flown with the N-23 and it sure looks like those wings have dihedral. Mike, I think I will try this on my next model. I use a 30% dope/70% thinner mix to 'seal' the tissue with. Is this enough of a dope coating to use the wicking technique, or should I go with a higher % of dope? The tissue decals are stuck on with a glue stick, but it sounds like your tip will produce a better looking finish. Something else I'm using...it's not unusual when I glue the decals on for an edge to come loose. To stick that edge down, I dissolved some Elmers glue stick in alcohol until it gets 'soupy'. Then I use a very small paint brush to dab the glue mix under the edge of the tissue decal and smooth it down. It usually sticks well and no further attention is needed. One note...I tried dissolving UHU for this but the UHU glue doesn't dissolve very well. Neal...yep, the French and Italians often produced some eye candy and then called them airplanes!! I saw that Northrop built their N-23 before redoing it as the C-125. The N-23 seems a bit less angular, at least to my eye! If you've doped the base tissue you can apply tissue markings over it by just placing the marking where you want it then flowing dope thinner onto the marking with a brush. The thinner wicks through the marking and dissolves the surface layer of dope on the underlying tissue, which wicks back into the marking tissue and solidly attaches it to the model. The neat thing about this is that surface tension pulls the marking tight against the covering - little to no poking, prodding or smoothing necessary to get a "painted-on" look to the markings. If desired when you're finished you can brush a sealer coat of thinned dope over the markings (or entire model). That said, your technique has produced an outstanding model. I think Tom used the word "pop," and that's a good description of your detailed tissue work, Alf...it "pops"...is very crisp and precise. Model gets a serious thumbs-up here. I believe you've got a real museum collection by now...hope you've found a way to display them. IMO...French and Italian aircraft of the period incorporated a design effort toward being artistic...art deco-like. Seems everyone else focused upon being utilitarian...while the French and Italians were creating works of art...IMO. Of course, there are many exceptions to that impression...but overall.... Your model is very artistic...and well executed...captures the spirit of the original design. Thanks much for everyone's compliments! There's much to learn from others here, for example, a previous poster colored his stringers, etc, with a red sharpie so that the framework looked better under the red tissue. I thought that looked really neat, and so I tried the same with this model. I used thinned acrylic paint (a white and grey from Vallejo) for the framework. I thought the white turned out better than the grey, but both seemed to cover the balsa color pretty well. The black and dark grey areas around the nose and nacelles are new tissue covering the initial tissue. Not master plan on this, I decided later to change the color for these areas and didn't want to remove the existing tissue. I found that I could apply the new tissue over the existing tissue by using a thinned Aleens Tacky Glue mixture (something like 60%-70% water). The initial tissue had been doped with a 30% SIG dope. The Aleens would soak into the doped tissue and look kinda wrinkled at first. I gently used the paint brush to smooth out the new tissue and was careful not to tear the wet tissue. As it dries, everything tightens up nicely. 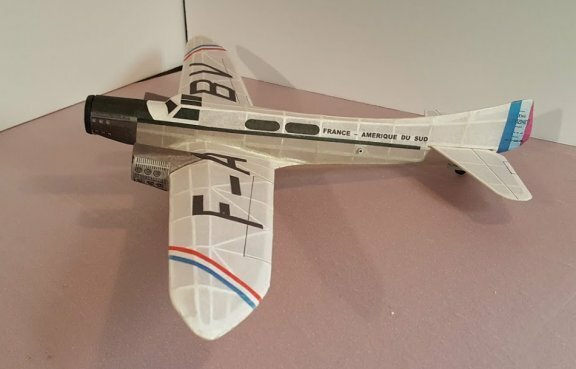 The cockpit and fuselage windows are black tissue stuck on with a glue stick and then painted with the Aleens mix. The cockpit is 1/32 sheet while the fuselage area is tissue. I do not do this to the tissue decals, however. I wish I could, but the water mix makes the decals bleed. I use a HP Deskjet with LxTek ink. This ink does not bleed if I use dope over it. Really nice work AK. The covering is great and your mastery of the tissue-cals is great, makes the plane truly stand out. 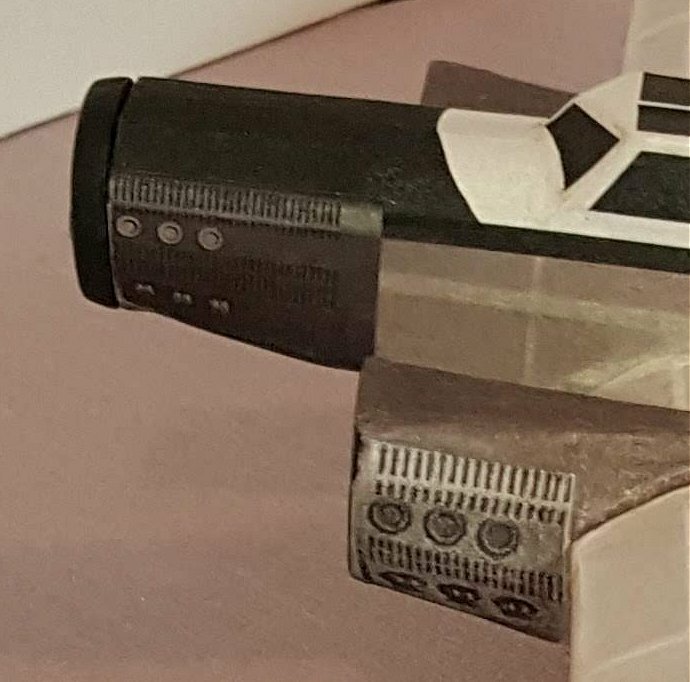 Ditto what the guys have already said: WoW love how the tissue decals make the nacelles pop! I REALLY want to see a video of this sucker in the air! I believe this is your pièce de ré·sis·tance thus far, mon capitaine....excellent work! Beautiful tissue work AK - a really nice-looking model. The tissue-cals for the engine detail are most effective. Yep, single prop. No spinners, just too small to do anything with. I plunge molded some spinners but am not too happy with the outcome. I used Dollar Store plastic plates. I've been reading up on how to make a prop, found several pdf files, lots of good info but may be too much work. Most likely, I'll go with a 6"-7" Pecks plastic prop. The engine details on the nose and nacelles came from a picture I found on Google. Copied it, made a tissue decal. Got the job done, that's about all I can say about it! AF...she's a beauty! I'm assuming you're going to use this as one power prop and two freewheeling props on the wings. I'm curious about the detail on the nacelles. Looks good but I'd like to see them up closer! You going to make your own prop or use a molded plastic prop? Pretty much done, waiting for prop. This is a composite model using features from the Couzinet 70, 71, and 101. 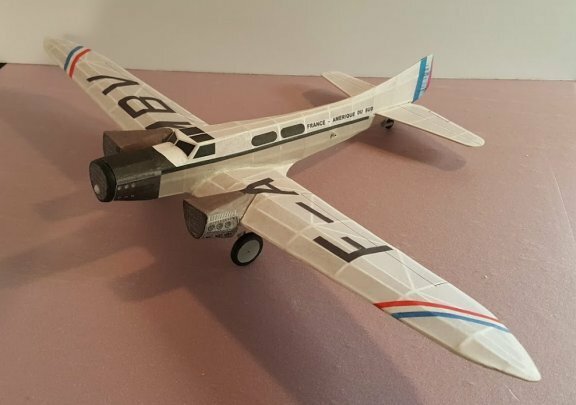 I'm really curious to hear how flights go with this one - at first glance the fin appears really small, but I think the way it's blended into the fuselage is deceptive. There's more area there than it looks. It's coming together very nicely AK.